Hi everyone Carin here! For my tutorial today to celebrate the fact that spring has finally arrived I decided to make a butterfly mobile to hang in my window in the beautiful spring sunshine (or for those of you who are heading into Autumn now it would work as something to cheer you up when those long winter days come!) Of course for this I just had to use the stunningly beautiful Gabrielle range. 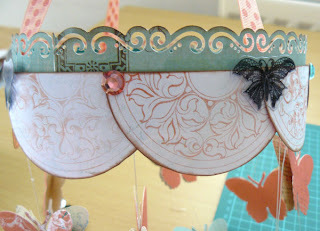 I started by cutting out a load of butterflies with my die cutting machine using Gabrielle Fairest, Romance and Stripe. 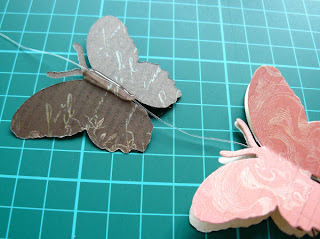 I used a Cuttlebug die which is quite large but of course you can use any punch or die and size of butterfly. 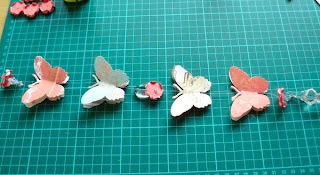 I chose to have a different length for each string starting with 1 butterfly on the first string and working up to seven so I used a total of 56 butterflies (28 back to back). I also chose various beads to add that would catch the light! Start by cutting a 2cm x 55 cm strip of very strong cardboard (I used mount board) then staple the ends together a good few times so you have a ring to work with. 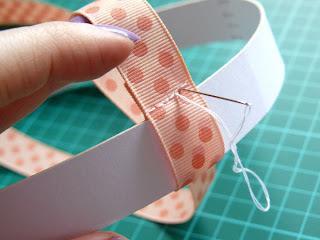 Cut two 60cm lengths of ribbon loop the ends over the ring and stitch together making a cross so that you have something to hang your mobile with, I also stapled them in place once I had them centred to keep them in the right place. 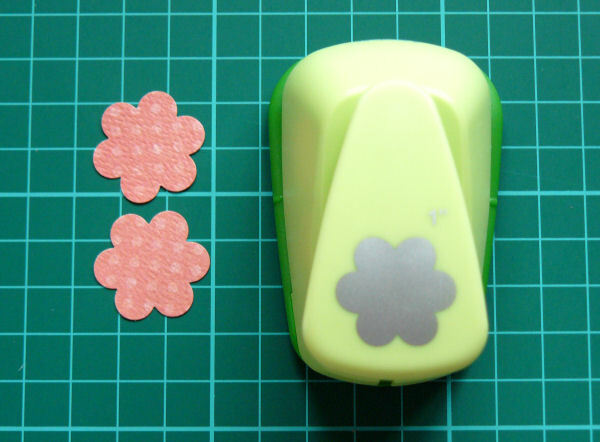 Cut some small flowers out of some coordinating card stock, I used Coral Dot Coordinating Double Dot and a small 5 petal punch and cut about 34 flowers out. 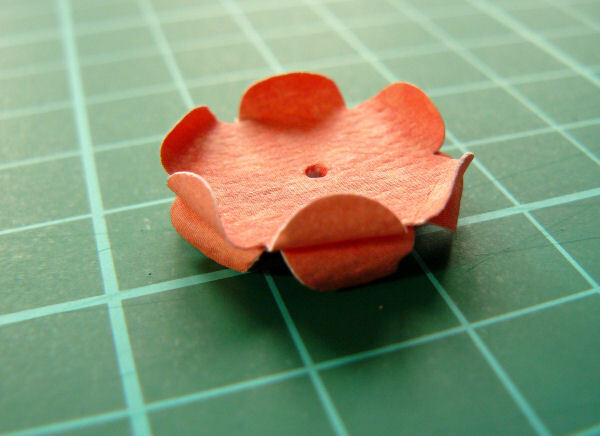 Use your paper piercer or something else thin to curl your petals. Stick 2 flowers together back to back and pierce a hole through the middle. 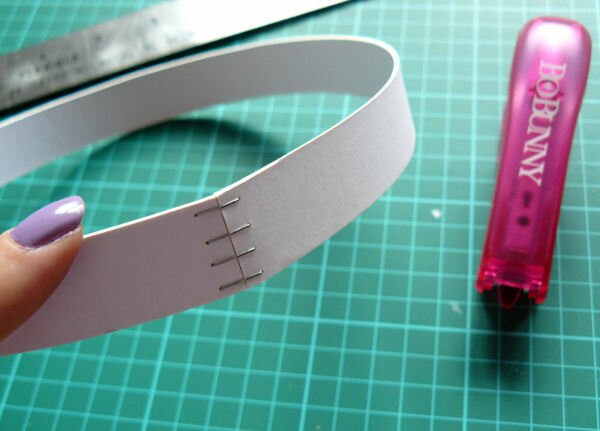 Then it is time to start making your strands. I used a stretchy jewellery elastic, the longest piece for the seven butterflies was about 28 inches. 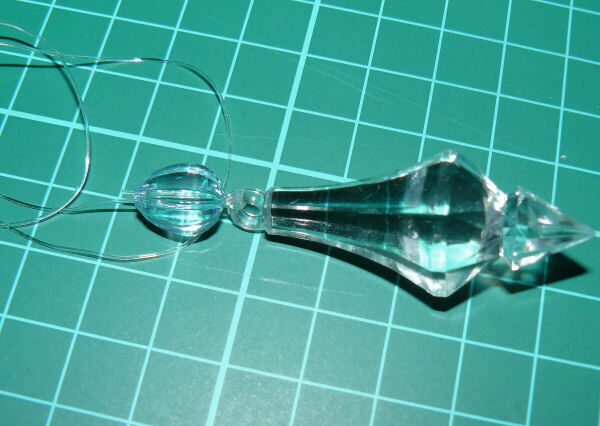 I started with these gorgeous chandelier style beads which I tied on then added another bead and threaded the end through then put a spot of clear glue in the end of the bead and once that dried, cut the end of the cord off and added one of the flowers. 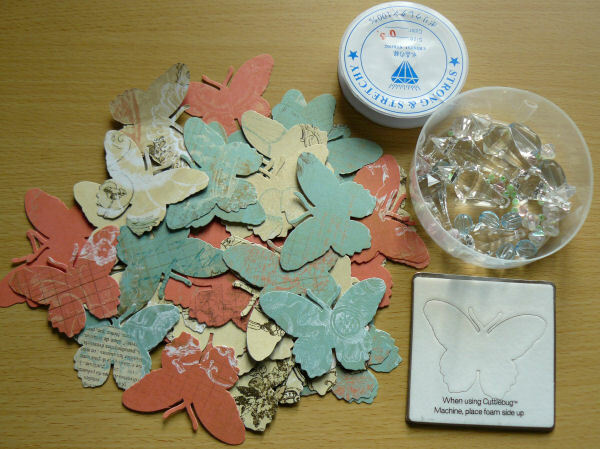 Start gluing your butterflies (after bending the wings out a bit) onto the string, using a hot glue gun or glossy accents using a thin line down the centre of the butterfly, putting the string through the centre and then adding your second butterfly on top. 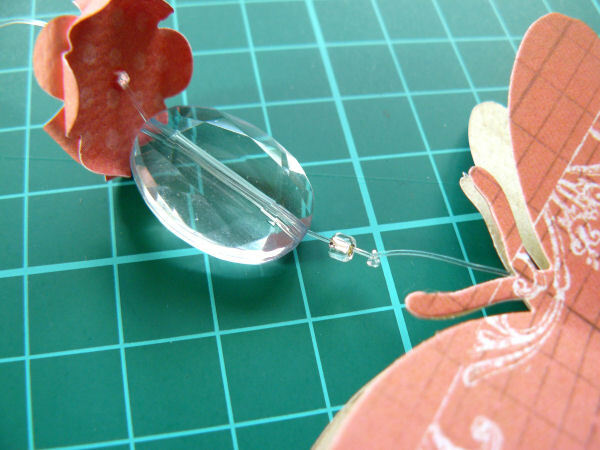 Add more beads wherever you would like them along the string by tying a knot to hold them in place and threading some beads and a flower on (I added them after every second butterfly). Once you have completed all your strands tie them along your cardboard ring that you made earlier and then cut off the excess. 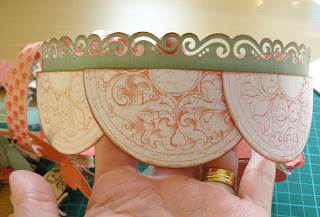 I then took some of the Gabrielle Promenade paper and cut some of the circles out of that, cut them in half and inked the edges. 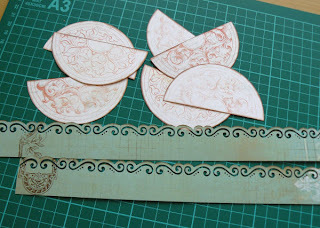 I also had a piece of Gabrielle Stripe paper left over from my butterflies which I used an edge punch on and then cut two 1 and a half inch strips and inked the edges of those. Use some double sided tape and stick the edged strips along the top of your cardboard ring. Put some foam pads on the back of the semi circles to add some dimension and then stick to your cardboard ring overlapping them by about 2 and a half centimetres. 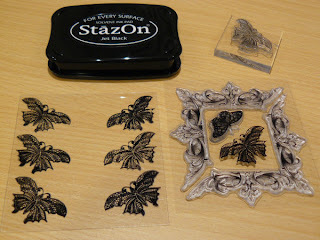 Use the Gabrielle stamp set to stamp some butterflies on some acetate with Stazon then cut them out and stick on the edges of the circles alternating with some of the Gabrielle bling. You then have your finished mobile to hang somewhere to make you smile! 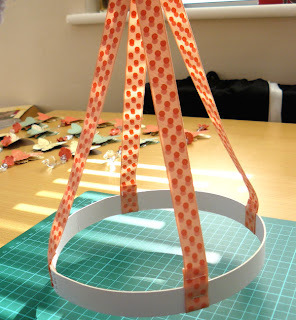 I hope you enjoyed the tutorial and if you decide to make your own mobile we would love to see it so please share it with us on our Facebook page here. This is gorgeous!!! I'm glad you showed us how you did this. I'm esp happy to see how you made your ring for the top of the mobile... I will have to use that idea! Great tutorial!!! Simply divine Carin, absolutely beautiful. Thanks so much for sharing how you made this. I just have to have those butterfly stamps even if I buy nothing else from the collection. this is so perfect and so beautiful, thank you for the tutorial! This is SO BEAUTIFUL!! You are so talented! Thanks for putting this tutorial together! This is just so amazingly beautiful! So gorgeous Carin! I love the Gabrielle collection. A very straight forward tutorial to follow too - thank you ! super cute project. thanks for the great tutorial. Gorgeous project! What a creative idea!!!!!! Gorgeous!!! Absolutely fabulous! 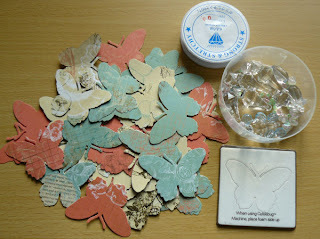 I totally love this project and adore my butterflies a ton! May have to make one of these for my scrappy room! Gorgeous mobile Carin, you are sooo clever! DD wants one now! Carin, love the mobile. Thanks for the instructions! That is gorgeous! It's similar to the ones we sell at Pottery Barn Kids, except it's almost free! Nice job! Love it!!! I can totally see this in a baby girl's nursery -- so pretty! This is cute and fresh :-) I simply love it! And it seem simple to make with a child :-) Thank you very much! Carin I have my mouth open. Girl you rock. It's so beautiful. I want to try it !! wowsers this is so stunning it look so happy with al those butterflies a really spring!!! Wow, what an amazing project, thanks so much! Beautiful!I love this! I am going to try this myself! What a great tutorial! Thanks for sharing it! wowww! just beautiful! and thank you for sharing how to do this project! I love this idea.. great work. 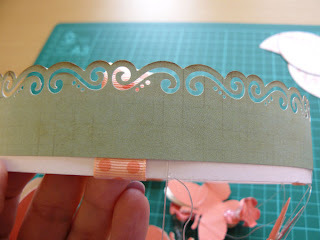 If you guys ever want to check out my blog I do a lot of scrapbooking with BoBunny paper. 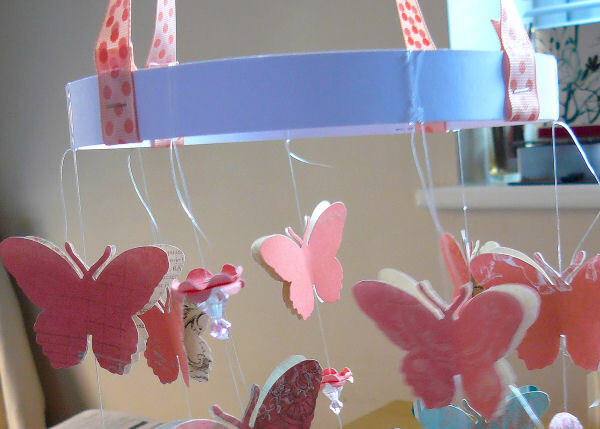 These mobiles always make me smile and wish I had a little girl's room to deocrate! Beautiful! Carin - beautiful project, and fantastic, easy to follow tutorial! What a brilliant idea. WOW, fabulous job on this mobile! LOVE IT! thank you for the tutorial! 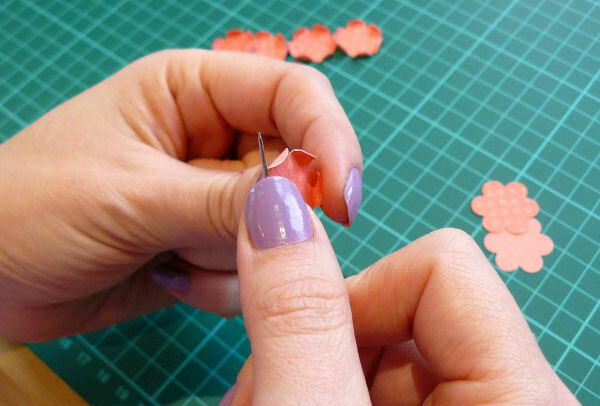 Awesome tutorial Carin!! clear step by step instructions and the result is Gorgeous!! Wonderful! This is the 1st time I visit and I'm following you. So pretty for spring! Everyone loves butterflies and the papers and colours are so gorgeous! Oh wow Carin this is absolutely gorgeous. i don't really talk english but i just want to say that this work is fabulous !! !